Private col­leges, espe­cially smaller regional schools, are in for a tough decade. Moody’s Cor­po­ration, a financial analysis and credit rating company based in New York City, pre­dicts that 15 private col­leges will close each year beginning in 2019. This rep­re­sents a drastic increase in clo­sures. According to Moody’s, from 2002 – 2011, only 47 private col­leges closed — less than five per year. Since then, rising costs, dimin­ishing endow­ments, and dis­ap­pearing student interest have pres­sured many col­leges finan­cially. In con­trast to a grim prog­nosis, however, Hillsdale has enjoyed a surge of interest and a healthy growth of its endowment. In 2018, the college’s accep­tance rate was 37 percent, down from 55 percent in 2014, 64 percent in 2007, and 85 percent in 2000, while main­taining similar class sizes, Senior Director of Admis­sions Zach Miller ’11 said. Its endowment vir­tually doubled from $295 million in 2011 to $574 million in 2017. Hillsdale’s endowment per student of $386,000 beats that of several ivy league uni­ver­sities like Cornell, Columbia, and Brown, according to data from College Raptor. In general, fewer stu­dents have enrolled in both public and private higher edu­cation insti­tu­tions since the Great Recession, according to data from the National Center for Edu­cation Sta­tistics. Peaking just above 21 million stu­dents in 2010, the number of stu­dents enrolled in col­leges fell to 19.8 million in 2016, the last year with available data. NCES projects a reversal in the current downward trend, but rising college costs and low birth rates around the country may con­tinue to deter potential stu­dents. Changing demo­graphics, espe­cially in the Midwest, could produce further hard­ships for private col­leges that draw from the region. Since the Great Recession, birth rates in the U.S. have dimin­ished from a healthy 2.12 births per woman in 2007 to 1.8 in 2016. Addi­tionally, the Midwest lost nearly one million people to domestic emi­gration alone from 2010 – 2015, according to the U.S. Census Bureau. Miller said about one-third of Hillsdale stu­dents come from the Midwest and, in the future, the college will have to find ways to recruit more stu­dents from around the country. Another problem facing private col­leges is cost dis­parity. The College Board reported the average tuition of a private college for the 2018 – 19 school year as $25,600 more than public col­leges, com­pared to $20,880 more in 2008. As this number grows, young adults trying to avoid debt may find public col­leges more appealing than their private coun­ter­parts. Liberal arts col­leges, which con­stitute most of the clo­sures, have a few options when facing what seems like their demise: con­sol­idate with other col­leges, retool to focus on tech­nical job training, or imitate larger schools by adding modern study pro­grams. Some schools simply can’t handle the pressure. St. Joseph’s College, an Indiana liberal arts insti­tution founded in 1889, closed its doors in the fall 2017, according to the Chicago Tribune. St. Joseph’s accu­mu­lated $27 million of debt before closing, and 900 active stu­dents trans­ferred to sur­rounding schools like Purdue and Marian uni­ver­sities. The cost of edu­cation influ­ences every aspect of the private college crisis. As financial burdens force col­leges to cut important pro­grams and raise tuition, fewer stu­dents apply and dona­tions move else­where. The quality of accepted stu­dents plummets, leading to a death spiral of appli­cation numbers. Hillsdale has seen just the opposite. The average high school GPA for the freshman class of 2000 was 3.56 with an average ACT score just under 24. This year’s freshman class boasts an average GPA of 3.81, scoring 30 on the ACT. Provost David Whalen attributed Hillsdale’s per­se­verance to its growing nationwide support base, citing financial backing as the key element to its success. Most col­leges use tuition to cover a portion of the total price tag, using endow­ments to cover the rest. Hillsdale is no exception. “The cost per student is above two times the cost of tuition,” Whalen said, adding that donors from across the country make up the dif­ference. College Board reported the average private college tuition for the 2018 – 19 school year was nearly $36,000. Hillsdale’s tuition the same year was $27,578, and for a better edu­cation than most private col­leges, Whalen said. Insti­tu­tions can recover from clo­sures, but it’s rare. Last year, The Indi­anapolis Star reported that St. Joseph’s suc­cess­fully restruc­tured its debt while keeping most of its campus. 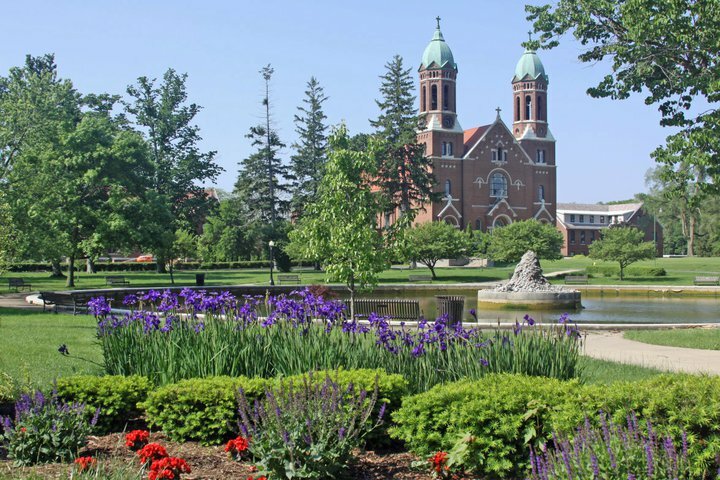 This summer, St. Joseph’s will reopen as a part of Marian, another liberal arts college, and hopes to relocate back to its original campus as soon as 2020. Other private col­leges avoid con­sol­i­dation and try to solve their issues by empha­sizing tech­nical skills and direct employment, often through a STEM-focused edu­cation. Frame­works like this can work. Mer­rimack College, a private insti­tution in Mass­a­chu­setts, shifted its edu­cation program to con­cen­trate on STEM and business training rather than the liberal arts it pre­vi­ously offered. Over the last several years, Mer­rimack has grown its student pop­u­lation, expanded its campus, and sta­bi­lized its finances, which were dire until the recent changes. But in the process, the college lost its liberal arts identity. Probably a good reason why, again, the college should help the city — already a quin­tes­sen­tially depressed Rust Belt munic­i­pality — to avoid becoming a smol­dering shell around the feet of its increas­ingly gilded campus up the hill. Wealthy, smart con­ser­v­a­tives aren’t forever going to agree to give four years of their lives to what resembles a typical rural hellhole when there are addi­tional attractive options (like Wheaton or Biola or U-Dallas) near their pre­ferred big cities — “liberal arts” or none. Add the fact that the college’s major donors — many of whom have actually never set foot in Hillsdale, Michigan — are not going to be around forever, yet it’s their money that props up this model and it will not be quickly replaced. I don’t say any of this glee­fully or out of dis­re­spect for either “town or gown”; nor am I asking Hillsdale College to trade away its edu­ca­tional phi­losophy or pour money into doomed enter­prises. But just start with funding a road or two — not least so prospective fam­ilies don’t crack a wind­shield on Fayette Street — and go from there. It’s “broken windows theory”: Cre­ating nicer envi­ron­ments leads to nicer every­thing else. Lesser col­leges and com­mu­nities have made it work. ALL col­leges need to be ‘run as a business’. The days of ivory towers are over with, universities/colleges need to rec­ognize they are pro­viding a service and a product-edu­cation-to stu­dents. There needs to be a tan­gible ROI for this service/product which makes the expen­diture worth­while, be it cul­ti­vating inquiring minds or whatever. Hillsdale College has done a great job focusing it’s unique phi­losophy to a portion of the student base who have been under­served by most higher edu­cation. But, you can’t be com­placent-the achieve­ments of yes­teryear are quickly lost to the chal­lenges of today. Hillsdale College needs to keep on chal­lenging them­selves on the quality of the product they market and the resources needed to keep their quality high. Pres­ident Arnn has done a great job to date, but it’s a moving target.